PLOT: A desk-bound CIA analyst volunteers to go undercover to infiltrate the world of a deadly arms dealer, and prevent diabolical global disaster. Having been one of the few people that hated Paul Feig’s breakthrough hit Bridesmaids, I also found his next feature, The Heat, to be formulaic twaddle trading on the premise that all you need is an overconfident fat person to put in embarrassing situations. So I can’t say that I was overjoyed with the prospect of his latest film, once again starring the criminally overrated Melissa McCarthy. 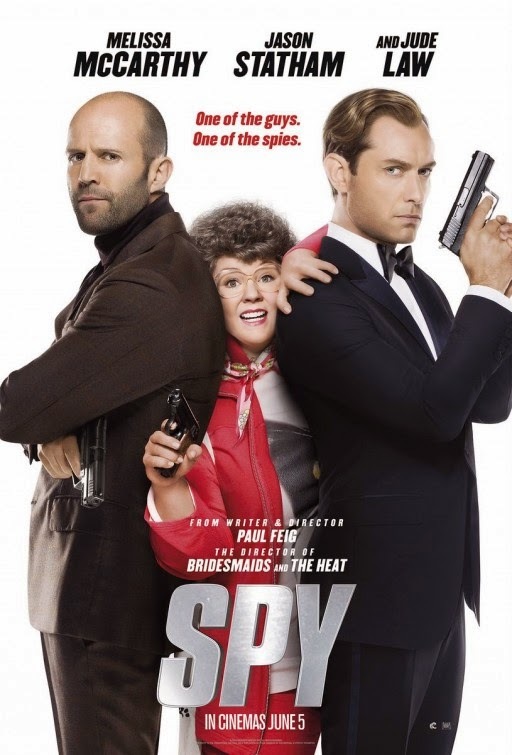 But with supporting roles from Jason Statham, Mr. Jude Law (not sure why he is billed as Mr, but it is on the poster and the credits), I thought I would give it the benefit of some considerable doubt. As per the textbook on by-the-numbers comedies, McCarthy is hapless, unlucky in love and larger than life, but somehow she has been employed by the CIA as desk agent. She is paired with Mr. Jude Law and helps him carryout his missions though an earpiece and a contact lense camera. When Mr. Jude Law is killed (oops… SPOILER ALERT! ), she convinces her bosses to allow her to take on a mission to save the world. Beyond saying that she does eventually save the said world, there is really little else to say about the bumbling plot that takes us on a road trip around Europe. Most/all of the laughs in Spy come from the excessive swearing from virtually all of the characters, but this seems to be Feig’s shameless way of getting a higher certification rather than specific character traits. The film is a PG Sunday afternoon job dressed up as a 15 to widen its appeal. Statham plays his usual meathead character, Law (sorry, Mr. Law) plays his usual suave but cocky self and McCarthy plays up to the camera like it is an overlong episode of Miranda with a guest appearance from Dawn French. Talking of Miranda, the lady herself appears as McCarthy’s friend and colleague in a role that is pathetically shoe-horned in for no real reason and to no benefit. Reading reviews elsewhere, it appears I am as wrong about this film as I was about Bridesmaids, but I can live with that. Spy is like an overlong, on location episode of Miranda with a guest appearance from Dawn French. If that is your bag then knock yourself out. For me, I’d rather be knocked out. I take issue with your review. “Overlong Miranda” ?? ?